If there were "knock, knock" jokes in 19th century Austria, the same riff might have been made about Anton Bruckner. 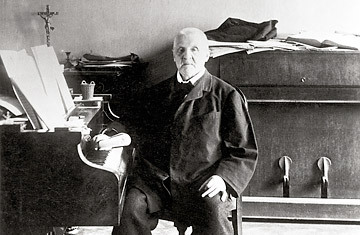 Bruckner's critics  and many concertgoers at the time  were turned off by the use of repetition in his symphonies, in addition to the breadth and length of those works. But when Franz Welser-Möst hears the repeated motives and rhythms, and the sweeping moods and textures of Bruckner's symphonic creations, he finds the roots of a dominant style of concert music in the last few decades. Welser-Möst calls Bruckner minimalism's grandfather. To prove that point, Welser-Möst  the music director of both the Cleveland Orchestra and the Vienna State Opera  has brought the Cleveland ensemble to the Lincoln Center Festival in New York City this week. In a series of concerts, the orchestra will perform four Bruckner symphonies (numbers 5, 7, 8 and 9) along with pieces by John Adams, whose work is born from the minimalist tradition. Welser-Möst calls the series the Bruckner: (R)evolution. By pairing an underappreciated late-Romantic master and contemporary of Wagner with a living composer whose works for symphony and opera are gaining ever more praise and popularity, Welser-Möst wants to expose audiences to masters who each grew out of a tradition and sought to expand it, and hopes audiences will find the connections that he sees so clearly between them. "I truly believe," he writes, "that the music of John Adams would be unthinkable without what Bruckner wrote." What Bruckner wrote were nine symphonies (not counting a study symphony and another numbered "zero" by scholars) and a great deal of music for his beloved Catholic church. The works are only occasionally programmed in North American concert halls and get scant radio play. A spokesperson for Lincoln Center says the Cleveland concerts mark the first time this many of Bruckner's pieces have been played in one stretch in New York in over 46 years. Perhaps the reason Bruckner is so rarely played in America is because he has not had a great champion among the conductors of this country's major orchestras. There have been notable Mahlerians (Leonard Bernstein and Michael Tilson Thomas famously among them), and music directors who have brought the near-complete works of other underappreciated composers to their audiences. But there have not been many (if any) diehard Brucknerians at the helm of a major U.S. ensemble. That is until Welser-Möst became music director of the great Cleveland Orchestra in 2002. From the start, he programmed Bruckner in subscription concerts, and, by the end of July, he will have led the ensemble in 17 performances of Bruckner symphonies in four countries in just under a year. During his life, Bruckner was overshadowed by Brahms, who hewed closely to accepted forms in his four symphonies. Audiences were not ready for Bruckner's radical departures (they fled from a performance of his third symphony) and many did not appreciate his friendship with and admiration for Richard Wagner. But part of the issue for Bruckner's modern reputation is academic. Though he was a highly regarded teacher, he was ever a student, always learning and revising his works (sometimes to please friends and critics in order to get the pieces played). Over the century after his death, Bruckner scholars argued over which of the various revisions best represented the composer's true intent. For concertgoers, the result can be disorienting. With more than one published version of many of his works, a listener may fall in love with a Bruckner recording, but hear a very different version in a concert hall. As a fellow Austrian, Welser-Möst says Bruckner is in his blood. He often recounts a story from his youth when he nearly wore out an LP of the Bruckner second symphony while his friends were listening to the Beatles. That encounter  and a shared birthplace in Linz  led to a life-long passion. His enthusiasm has clearly rubbed off on the players in Cleveland. Before the performance of Bruckner's seventh symphony on July 14, the ensemble had time for only one rehearsal and had not rehearsed the piece  except for one May performance at Oberlin College  since last September, according to an orchestra spokesperson. The performance, beautifully played but not flawless, showed that the Orchestra members are in sync with Welser-Möst's bond with Bruckner, and have adopted these works comfortably into their repertoire. They seem equally at ease with the rhythmic complexity and aural scenery of Adams. Moviegoers will know Adams' work as the driving pulse under the lush and taut tragic romance of Luca Guadagnino's 2009 film I Am Love. The orchestra offered effective mood and intensity to complement a fiery and dexterous performance by Laila Josefowicz in Adams' difficult Violin Concerto. The series began with Adams' sonic travelogue: A Guide to Strange Places, paired with Bruckner's fifth symphony. That symphony is the first Bruckner piece Welser-Möst conducted when he was a mere 24 years old. Bruckner himself called his fifth "my contrapuntal masterpiece," and its counterpoint plays at times like sacred mathematics, an intricate fugue with ethereal melodies. Sadly, Bruckner never got to hear his counterpoint in full performance; he was ill the only time the piece was played by an orchestra during his lifetime. Bruckner's counterpoint is uniquely polyphonic. Adams' post-minimalism is cinematic and polyrhythmic. And the first two evenings proved there is much to enjoy in their pairing. The question remains if the attendees standing in admiration after the performances of these works see the connections the way Welser-Möst hopes they will. A quick poll of the audience at Avery Fisher Hall found attendees ranging from diehard Bruckner fans to Adams aficionados to others eager to hear a top-tier orchestra from the heartland in a Big Apple venue. In the final concert on July 17th  which pairs Bruckner's 9th symphony with Adams' much-lauded Dr. Atomic Symphony  concertgoers can determine for themselves if minimalism's grandfather and grandson share the same DNA. See the best plays and musicals of the decade.